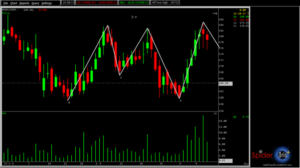 What is Triple Top chart pattern? Triple Bottom is a pattern used to predict the reversal of a prolonged uptrend. A triple Top pattern shows 3 different small tops near the similar amount. The triple top is regarded to be a difference of the head and shoulders top. There are three equal highs followed by a break above resistance. The triple top pattern consists of three acute highs at around same price levels. The bounce off the support near the third low is a clear indication that selling interest is almost exhausted. It is used by traders to predict the reversal of the downtrend. The pattern is completed when the price moves above the support level and begins trading in a downwards trend. How to Trade with Triple Top Chart pattern? The typical development takes around 4 months to develop. The triple Top is one of the longer patterns to develop. The triple Top is a reversal pattern. This means it is important to the quality of the structure that it start with a uptrend trend in a stock’s price. All three highs should be reasonably equal. As the Triple Top Reversal develops, overall volume levels usually increase. After the third high, a decline in volume and the support breakout greatly reinforces the soundness of the pattern. The distance from the support breakout to highs can be measured and added to the support break for a price target.